In 2003 my husband and I took and amazing trip to Washington state. We had been to England & Ireland the year before. Even though we were in Ireland during the rainy season, there hadn't been much rain and it wasn't green like I expected it to be. Washington was every bit as green as I thought Ireland was going to be. We spent a couple of days in Seattle, then headed for the Olympic Peninsula. It. was. gorgeous. Not only were the shades of green amazing, but the lichen, the plant and the flowers were amazing. Something I kept noticing were the ferns. 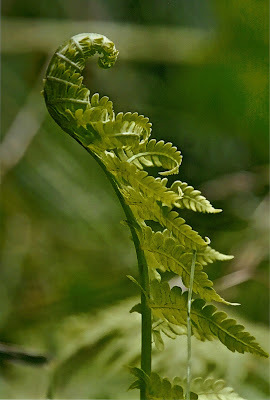 Have you ever really looked at a fern as it grows? I've work in Aveda salons for well over a decade and would see it all the time. A tiny shoot comes out of the ground. All the leaves are curled in and the stem is wound like a pinwheel. It's only when the fern grows that the pinwheel unwinds and the leaves begin to uncurl. It grows and grows until not only is it open, it's bent over backwards basking in the warmth of sun. I am like that fern, all curled into myself. Not only do I hang on tight to the things in life, I bring it into myself and curl my grip around it. Surrender it to me. I hear the Lord say. Instead of releasing my grip, I hold on tighter, curl in tighter. I am loosening my grip. I'm am choosing to surrender. Each year while I was growing up, we would take our annual last boat ride of the season to see all the beautiful Fall colors. Even as an adult off at college, I would try to make it back for the ceremonial last ride. The last few years we had the boat, my mom requested we camp on the river for her birthday, October 4th. Needless to say, it was always very cold. In the morning my mom would make a big pot of oatmeal and we would add in all our favorite flavors. Since it was so cold, we often had a campfire burning most of the day. My mom loved the smell of leaves burning. She would stand in the smoke of the burning leaves so all her clothes, even down to her pores, would smell of campfire. In the years since my family sold the boat, my Fall color boat rides have been spotty. This year, however, I was determined to go. I added it to our Google calendar (that means it's going to happen). While packing lunch, snacks, and all the gear needed to spend the day on the river, I told my boys to bring what they needed for the day. "Once we leave," I said, "we're not coming back until night and you don't want to be bored." Those words rang in my ears as I sat on the island with nothing to do. My boys were up to their hair in sand and my husband was happy to lay in the sun. Unable to let myself simply be. Memories began to haunt me. Memories of all the past trips on the river. Memories of my mom. I grabbed my camera and decided I was going to let myself have the time to take pictures. After all, I was in one of my most favorite places, at my most favorite time of year. That beautiful burst of yellow standing out against the muted burgundy, brown and green. It was so beautiful. I feverishly began taking pictures, attempting to capture the beauty all around me. Suddenly, I became very aware of why the trees were so beautiful. As the nutrients they need to live are drained from their veins, their colors show through. There is beauty in death. Had someone said that to me three years ago, after my mom lost her battle with cancer, I would have thought them insensitive, hurtful, and a little "Pollyanna". Time and allowing myself to grieve as I needed to grieve have given me a different perspective. I'm beginning to see the beauty that can come from death. I'm beginning to see beauty from the ashes of loss and grief. I better understand "Blessed are those who mourn, for they will be comforted". The loss of our three babies through miscarriage has made me more aware of the gift of relationship with my two living children. It has given me the ability to sit with women in their grief. The loss of my mom has given me more than I could have ever imagined. What I have learned about the Creator of the Universe. What I have learned about who he is and who I am in him, has been indescribable. My relationship with him has grow in ways I could have never imagined. I have grown in ways I would have never imagined. It's hard to recover from the loss. But I'm learning, there is also beauty in death.